The luxurious Sofitel Rome Villa Borghese takes its name from the neighboring Villa Borghese Pinciana, a beautiful, Renaissance-Era palace where the prominent Borghese family once resided for centuries. The hotel itself has existed since the early-19th century, when fellow aristocrats from the Boncompagni Ludovisi family constructed a guesthouse adjacent to the Borghese estate. The building did not become a hotel until 1890, when it underwent a significant renovation. Operating as the Boston Hotel, the former aristocratic residence entertained some of the most well-known movie stars, including Sean Connery, Elizabeth Taylor, and Richard Burton. Even the renowned director Frederico Fellini frequented the hotel after he completed his critically-acclaimed film, La Dolce Vita (1960). Today, Sofitel owns this fantastic building, running it as the Sofitel Rome Villa Borghese. Sofitel has worked to preserve the rich, cinematic heritage of the building, allowing guests who visit to still feel the potent, glamourous presence of its illustrious clientele. 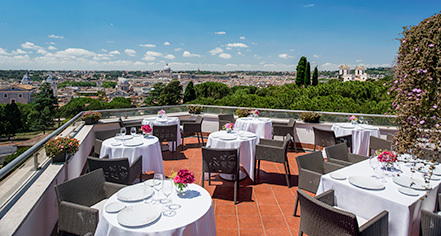 Sofitel Rome Villa Borghese has 78 pristine guestrooms and suites that connect its patrons to the storied history of the site. The hotel has looked toward its cinematic heritage when seeking inspiration for its accommodations, decorating the spaces with iconic memorabilia that commemorate the film luminaries who have stayed there over the years. However, Sofitel has also combined French and Italian elegance when designing each space, ensuring that every guest’s stay is one of modern luxury. Guests can satisfy their palette by dining at the outdoor La Terrasse Cuisine and Lounge. La Terrasse offers wonderful views of Rome with the experience of Chef Giuseppe D’Alessio’s delicious Mediterranean menu. The restaurant and the accompanying bar, La Littérature, also provide the perfect setting for private events. Guests can host intimate social gatherings for colleagues and friends at La Littérature, or entertain parties of up to 120 people at La Terrasse. The concierge is also available to plan trips into Rome, providing useful recommendations and booking services that will make every day a pleasant one. Known throughout the world as the Eternal City, Rome offers visitors an endless array of historical, cultural, and artistic experiences. Just beyond the hotel are several historic villas once occupied by the eminent noble houses of the Italian Peninsula. Villa Medici and Villa Borghese Pinciana are a short distance away, with Villa Borghese functioning as a respected art gallery, the Galleria Borghese. Guests can also stroll through the beautiful Borghese Gardens, which run adjacent to the gallery. The Historic Center of Rome, a section of the city jointly supervised by the Italian government and the Vatican, is close to the hotel too. A UNESCO World Heritage Site since 1990, the Historic Center of Rome has a wealth of historical attractions for guests to visit. The Basilica of Saint Paul and the Sistine Chapel both occupy the Historic Center of Rome, as do many other historical structures like the Colosseum, the Pantheon, and the Roman Forum. Sofitel Rome Villa Borghese is a wonderful place to start any excursion into the Eternal City. 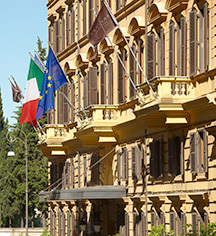 Sofitel Rome Villa Borghese, a member of Historic Hotels Worldwide since 2018, dates back to 1890. Ava Gardner and Walter Chiari hid away from the paparazzi at the hotel as their high-profile romance blossomed after costarring together in The Little Hut (1957). Hotel/Resort Fees & Taxes: There is a city tax of €7 per person, per night. Parking: Nearby private parking is available. Rollaways: Available for deluxe rooms and upward. Sofitel Rome Villa Borghese is undergoing total refurbishment and will reopen in March 2019 The luxurious Sofitel Rome Villa Borghese takes its name from the neighboring Villa Borghese Pinciana, a beautiful, Renaissance-Era palace where the prominent Borghese family once resided for centuries. Learn more about the History of Sofitel Rome Villa Borghese .